See how this travel brand became a Google trending story, after we created some data-led jet-setting content. The brand needed to harness data-led content to be thought leaders in the travel world. Our Challenge Standing out in the travel sector. When Broadway Travel came to us, they wanted to be seen as thought leaders in the saturated travel sector. Zazzle Media were challenged with increasing brand awareness, driving traffic and equity to the Broadway site in order to push up rankings. So as part of a wider content strategy to achieve these aims, we set out to create a campaign around a big piece of link worthy content – allowing us to reach higher metric sites, and therefore push more authority back into the Broadway domain, increasing their reach and solidifying their brand name in the space. Our Solution Using data and content to get ahead of the industry. We wanted Broadway to be one of the first in the travel industry to predict 2019 travel trends – cementing their place as thought leaders in the sector. 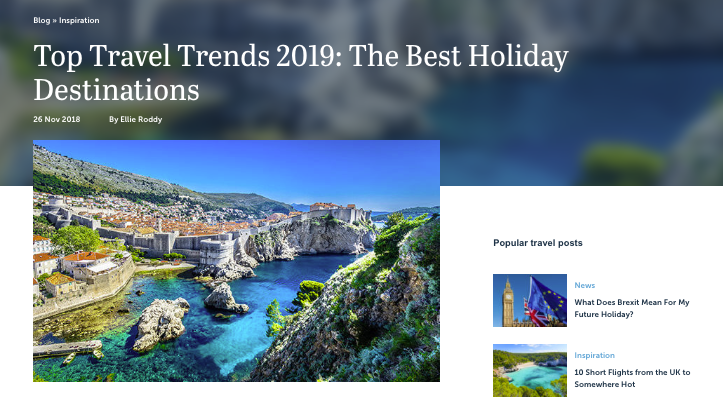 In order to make the piece the best in the space, we created Top Travel Trends 2019 – this piece was heavily data-led, and all data was mined by our own Search team, meaning this content is completely unique to Broadway Travel. The data can also be refreshed year on year, meaning this content piece can be evergreen for the brand. We knew a data-led approach, presented in a really attractive way, would appeal to larger sites, so this is where we focused the distribution efforts. The piece went live in November 2018, in order to be the first in the industry. This early release did mean we only really had a small window to secure placements as the content would become out of date after December. This did not stop us securing several high quality links in this short period of time. Our results Sky-high links and a trending placement on Google, set the travel brand apart from the competition. The trends piece managed to gain high quality, authoritative links which provided incredible exposure for the brand. As well as these links providing great brand awareness for the travel brand, Broadway Travel were featured as a top story by Google, within 24 hours of the Travel Trends piece going live! The content was featured on popular travel sites, such as Travel Weekly – they receive over 80k organic traffic, getting Broadway’s content in front of many users in the relevant sector. This link also gave Broadway excellent domain authority through it’s 56/43 trust and citation flow score. A link from Refinery29, a popular media site, also positioned Broadway’s content in front of over 1 million eyes, just based on this placement alone! The link from Refinery29 was also high authority, with 43/78 trust and citation flow, ensuring that high domain authority will be pushed through to Broadway Travel’s own site. As well as featuring the findings of the Travel Trends content, Refinery29 also shared on their Twitter, ensuring the content we created was seen by an extra 17.5k followers!